Bhel Puri is a savory snack prepared with puffed rice with added vegetables, sev and the delicious sweet dates and tamarind chutney. I include green chutney too in my version, and this is the wet Bhel puri recipe. Even though the recipe originated in Bombay, it has spread its wings across the Indian Subcontinent, and every place has its own Bhel recipe. 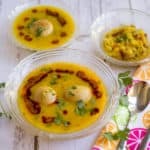 I have already posted the Kolkata version which is popularly known as Jhal muri and my own Tortilla Bhel Cups with moong dal. Now here comes the wet Bhel recipe. 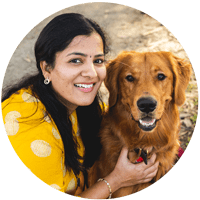 When I think about chaats, the two recipes that come to mind are Pani Puri and Bhelpuri. 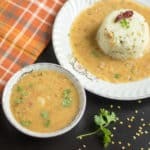 Cutlet, Pani Puri, and Bhelpuri were the first three recipes that I wrote down on my list. I wanted to post all these three in the very first week, but later I had to shuffle the schedule to make the spread much more interesting. 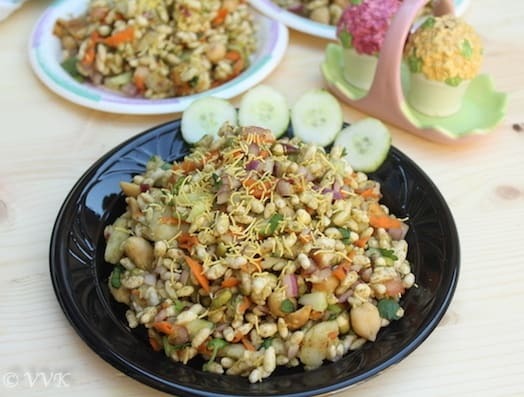 This bhelpuri is a versatile recipe, and you can adjust the ingredients as per your preference. You can skip papdis and add tortilla chips instead and also replace potatoes with other veggies. I usually add carrots, cucumbers, onion, tomatoes and green chilies. I love spicy and tangy bhel puri. So along with green chilies, I add the green chutney. I spice up the bhel with amchur powder, chaat masala, jal jeera masala and lemon juice. But you can add more or less of this masala and adjust as per your preference. Chop the onion, cilantro, green chilly and cucumber. I usually remove the pulp of the tomato and chop them. Peel the carrot skin and grate them. Boil the potato in your preferred way and mash them up. If the murmura or puffed rice is not crisp, then dry roast for a couple of minutes or sun dry them for about 1 hour. Take the murmura in a wide bowl. Then the chutneys, dry masalas, sev and mix well. Before serving, add the lemon juice and serve. That’s it. Bhel puri is ready. You can skip the papadis and instead use tortilla chips or Ritz crackers. 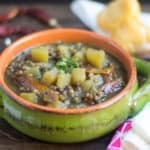 You can skip green chilly and use more green chutney, or vice versa can be done too. Adjust the masalas and spices as per your preference. I used black salt instead of regular salt. You can use half and half of both or either one. 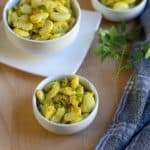 Any other sprouts can be used too instead of garbanzo beans. 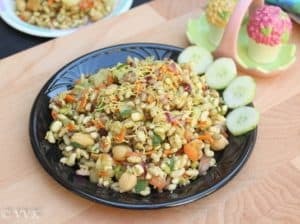 Bhel Puri (Wet Bhel) is a savory snack prepared with puffed rice with added vegetables, sev and the popular sweet dates and tamarind chutney. If the murmura or puffed rice is not crisp, dry roast for couple of minutes or sun dry them for about 1 hour. Take the murmura in wide bowl. 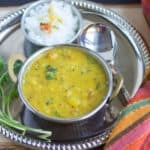 You can skip papadi and use tortilla chRitzor ritz crackers can be used instead.You can skip green chilly and use more green chutney or vice versa can be done too. All time favorite snack. Can munch on this all day. I was thinking you have already shared this…who can resist Bhel!..lovely presentation..
That plate is super tempting. I am very sad that we don’t have a good chaat place near us to enjoy these. Another classic chaat. Bhel puri looks absolutely delicious. OMG! My tummy is grumbling that I am not feeding it anything as interesting as this bhel. Delicious your pictures are making a mockery of my dinner of muddi palya something that we adore. 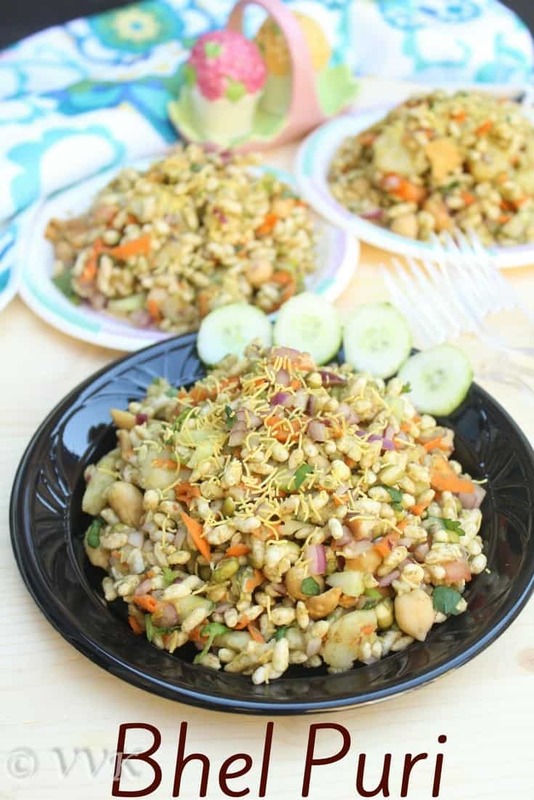 Bhel puri is a house favorite here! Your version looks tempting. Love the guilt free and flavorful bhel. That plate of your bhel looks so inviting. Bhel puri, this dish is my all time favourite and prefect to dish out to munch anytime of the day. I love bhel anytime …. Good share vidhya…. 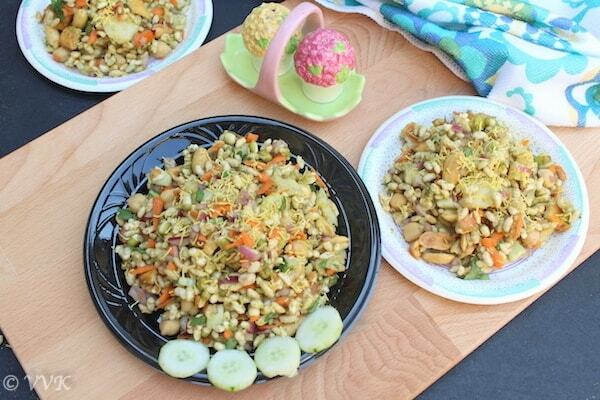 I like anything with murmura and that is a tempting plate of bhel puri!! This is one guilt free chaat,love it to the core.Love the mixture of tastes in Bhel. You are tempting me too much with your month long chat series. I really need some bhel puri right now..
That is an irresstible bowl of bhel. Love it. yummy yummy yummy ! keep them coming ! I love your version of bhel..it has a lot more than what a bhel puri vendor mixes in..cool pics too.